For some years now the 37-year-old Arab Israeli Hebrew writer Sayed Kashua has been contributing a column to the weekend magazine of Ha’aretz that is a miniature marvel of self-presentation. Kashua writes first-person vignettes in an easy, every-guy voice as if he were just another working stiff, married with kids, who is trying to make his way in the world. If that were all, his little tales would still have a lot going for them. But that is not all. He is an Israeli Arab who writes in Hebrew and has made it within the world of Israeli Jewish journalism and popular culture while remaining proud of his Arab identity and illusionless about the civil disabilities of Israel’s Arab citizens. Prized by Hebrew readers for the uniqueness of his voice, Kashua has been vilified in the Arab press for being a cultural collaborator. Kashua has turned the dilemmas of living entangled in these two identities into an opportunity for antic observation rather than portentous agonizing. He has a gift for taking the small absurdities of everyday existence and the comic humiliations of family life, themselves served up with self-effacing deadpan humor, and making them comment on the bigger, and often darker, contradictions of his life and the two cultures in which he lives. “What do you mean?” I answered in Hebrew. There was absolutely no chance I could hide the mop and the bucket. “Because of people like you they said they would fire me, sir,” he said. Kashua (or his persona) gulps down a cocktail made of equal parts of self-importance, scruple, and embarrassment. He is clearly satisfied with himself for working on an equal footing with his Jewish coworkers; but his pleasure is undercut by his awareness that he is doing so in the presence of Arabs performing “Arab labor”—the name of the successful TV show he writes—even though they have no clue he is one of them. And his efforts to remain morally spotless end up endangering the livelihood of these real Arab laborers. These smart little performances, so ingenuously economical in their telling, depend for their success on the garrulous persona of a speaker, a kind of Arab schlemiel, who is always inadvertently revealing more about his foibles than he intends. It is all so chatty and home-cooked that it seems to resist literariness; but the fact is that Kashua’s writing in these columns is the lineal descendent of the Russian skaz and the European feuilleton, as well as the monologues of Yiddish literature. It is a nice irony to consider that the Hebrew writer today whose way with the monologue is closest to that of Sholem Aleichem’s is an Arab. But it is a long way from the syncopated precision of a weekly column to the expansive polyphony of a novel. One opens Kashua’s new Second Person Singular wondering whether he can shift gears and adapt his gifts to a very different genre. The good news is that, although he may not be a novelist of elegance and depth, Kashua has a solid grasp of three key opportunities afforded by the novel that cannot be realized in his weekly performances. The first is the chance to present a systematic and sustained account of the Arab Israeli professional elite to which he belongs. The second is the availability of plot as a means of tracing the conflict and entanglement among different versions of Israeli Arab identity. Finally, the novel offers Kashua relief from the burden of continually having to write in the first person singular. The novel contains two separate narratives told in alternating sections. The protagonist of one is a successful criminal lawyer living in East Jerusalem and practicing in the West. The protagonist of the other narrative, also an Israeli Arab, is an introverted former social worker who works as caretaker for a young Israeli Jewish man his age who is severely ill. The two are ignorant of each other’s existence until the final pages of the novel, although the reader is privy to the slight but consequential connection between them. The lawyer has plenty of his own tics, but remains nameless, apparently because he is meant to represent a whole class of Israeli Arabs who have graduated from Israeli universities and make their living representing the interests of Arabs in Israeli courts and elsewhere. The lawyer grew up the son of uneducated parents in one of the Arab villages in the Triangle (along the eastern Sharon Plain among the Samarian foothills), excelled in school, took a law degree at the Hebrew University, and then made the crucial decision to stay in Jerusalem rather than return to his village. In doing so, the lawyer joined a colony of well-to-do and high-achieving professionals (accountants, doctors, and other lawyers) who occupy a self-ascribed social status superior to the villagers they left behind, as well as the locals among whom they live in East Jerusalem. Kashua is at his mordant best in describing the obsession with status that rules the lawyer’s life. For example, the lawyer envies his Jewish friends their fuel-efficient Japanese cars they can keep for years on end. He, alas, can do no such thing. “He knew that if he did not upgrade his car to a model that surpassed what the competition was driving, it would be seen as a retreat . . . If one of his competitors bought a BMW with a V6 and three hundred horsepower, then he had to get the Benz with the V8 and a few hundred more horses under the hood.” In dress, he has to know the difference between Ralph Lauren and Versace because his respect as an Arab depends on his appearance and will make the difference in whether or not he is stopped at a crossing by the Border Police. He married early because he knew his Arab clients would not trust a bachelor. His wife is beautiful, educated, and a good mother, but he demeans her work as a therapist-social worker because of its insignificant income compared to his, and he has in fact never truly fallen in love with her. What he most envies in his Jewish friends is their easy familiarity with Western culture, the fruit of several generations of adaption to modernity. He compulsively puts together lists of the books recommended in Ha’aretz and makes a weekly visit to a bookstore to load up on works in hopes of remediating his cultural deficit. And it is one of these visits that turns out to be his downfall. From the pages of a second-hand volume of Tolstoy’s The Kreutzer Sonata—itself a story about jealous rage—falls a note in his wife’s Arabic hand that hints at the existence of a romantic liaison. The lawyer becomes unhinged as he wildly—and of course, mistakenly—imagines the most flagrant sorts of marital betrayal or, even worse, the possibility that his wife slept with another man before marriage. In one stroke, the entire complex of professional achievement and social ascendance and enlightened attitudes the lawyer has labored so hard to erect begins to unravel. The distance he has endeavored to place between himself and the tribal codes that legitimate honor killings is swept away by homicidal rage against his wife. The investigations the lawyer undertakes to probe his wife’s supposed infidelities eventually bring him in contact with the young Israeli Arab, a doppelgänger of sorts, who is the protagonist of the contrapuntal sections of the novel. (His sections are told in the first person, the lawyer’s in the third.) Amir Lahab is the son of an Arab who was murdered after working with the Israelis; he grows up as an outsider in a village not his own and uses his good grades to escape to Jerusalem and obtain a university degree. He is shy and uncouth and shares little with other young Israeli Arab men in Jerusalem who chain smoke, are obsessed with girls, and are marking time in their bureaucratic jobs until they can return with their degrees to their home villages. He becomes fascinated instead with the cultural world of Yonatan, the young man in a vegetative state for whom he cares in the evenings. Yonatan had been a precocious student in the elite circles of professors’ children, and it is among his books and CDs during the long nights of caring for him that Amir discovers an engrossing new cultural universe. Availing himself of Yonatan’s sophisticated camera, he discovers a passion for photography and, with the approval of Yonatan’s mother, he applies and is accepted to the Bezalel Academy using Yonatan’s name rather than his own. (Ironically, Bezalel rolls out the red carpet for Arab applicants, but Amir does not want to be taken on the basis of affirmative action.) Upon the young man’s death, his caretaker assumes his identity in name and in spirit. Amir Lahab becomes Yonatan Forschmidt and continues to pass as an Israeli Jew who is embarking on a promising career as a photographic artist. Why does Kashua divide Second Person Singular into two narratives with two protagonists? What connects the two, beyond the note that indicates that Amir and the lawyer’s wife once met? Kashua appears to have taken the bumbling but grounded persona of his newspaper columns and split it into its two more extreme and unstable components. The grandiose lawyer is a send-up of the Israeli Arab who is obsessed with status and the accoutrements of Western culture and defines himself in contrast to his more “primitive” brethren. The withdrawn and reticent Amir/Yonatan grows up in an atmosphere of emotional and cultural deprivation and sees little in the new or the old Arab culture worth emulating. The fact that both figures lack a core sense of self explains why their characterization is superficial. Because he is writing a novel about the construction and performance of identity, Kashua’s characters by definition cannot be deep or given to self-reflection. This is probably not, in any case, Kashua’s temperament as a novelist. He has a sharper eye for the absurdities of self-presentation and intra-group discrimination than he does for what goes on inside the soul. This absence at the center suggests a provocative skepticism about whether the Palestinian narrative possesses enough cultural substance to nurture the roots of Israeli Arab identity. There is a lot in Kashua’s novel that reminds one of the early Philip Roth, the Roth who scandalized the American Jewish community by exposing the unruly appetites and ambitions behind the decorous march of acculturation. One imagines Israeli Arab readers being discomforted in the same way, and like American Jews, one hopes, becoming less anxious over time about such fictional acts of truth telling. Not so oddly perhaps, Kashua’s voice is the closest thing in Israeli literature to the quandaries of identity that absorb diaspora Jewish literature. His writing, both in his columns and his novels, probes a common question about assimilation: not whether it is good or bad but whether it is possible. Alan Mintz is the Chana Kekst Professor of Hebrew Literature at the Jewish Theological Seminary of America and the author, most recently, of Sanctuary in the Wilderness: A Critical Introduction to American Hebrew Poetry (Stanford University Press). Eternal Life is Dara Horn’s fifth novel, and like her others it crosses time and place to tell a transfixing, multilayered story that draws on Jewish texts and themes in a deep, witty, and immensely readable fashion. 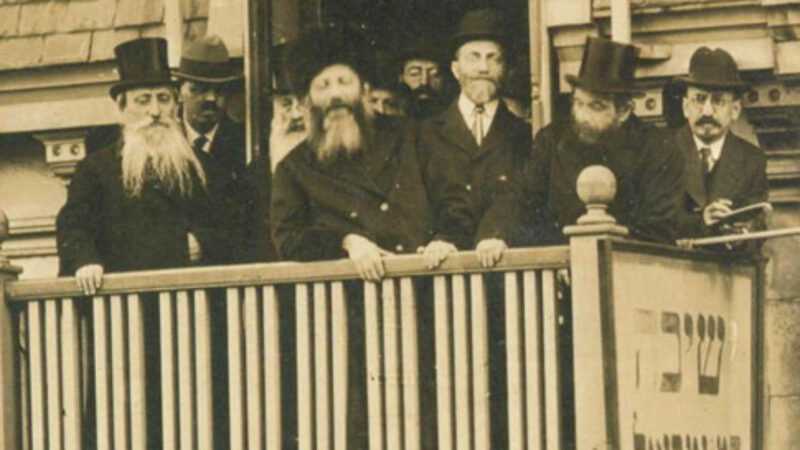 A new intellectual biography explores the thought and legacy of Rabbi Abraham Isaac Kook.